Instead of creating individual pipelines, we recommend sharing a central pipeline with your team. This will keep your team from duplicating work and gives everyone clarity onto who is working on what. Add or modify columns in the pipeline (without the ability to delete). You can customize this further, too, if you need to restrict or allow more permissions. Navigating to the pipeline you'd like to share and clicking the Private button in the top-right corner to open the pipeline's sharing options. If you would like to share the pipeline with your entire team with the default settings, just click Save Changes. Your team – both future and current members – will gain immediate access to the pipeline, including its boxes and associated contacts. 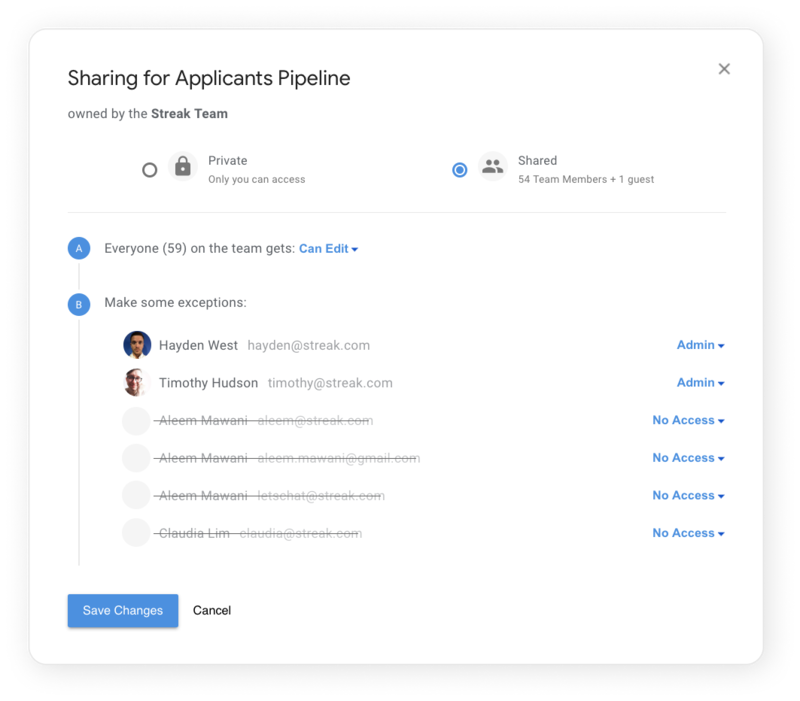 If you have a pipeline that only needs to be shared with a few members of your team, click Advanced in the bottom right corner of this window. This section is where you can adjust specific permissions for your team – both on a specific and general level. Here you can access adjust the role associated with each member of your team (the B section of the Advanced settings). You can also adjust your team-wide sharing defaults (the A section) for new users added to your team. If you do not want to automatically share this pipeline with new members of your team, you can adjust the sharing setting default to No Access and change that for specific members in the list below.